Finals were done yesterday, so I had a little more time today and managed to get down to the park a couple of times. My late morning/early afternoon visit was my reintroduction to the summer season. After months of having trails largely to myself, the park was full of people with two large cruise ships in town. By the time I went on my second trip in the late afternoon, things were much quieter. Weather: The day started out overcast with a little bit of rain now and then. During the afternoon it started to clear up and my second walk was under mostly sunny skies. It remained mostly clear through the evening and early part of the night at least. Birds: I saw quite a few birds on my walks today. The Hermit Thrushes were fairly abundant. I saw them mostly along the edges of forests and clearings, with quite a few along the edge of the river. Altogether I probably saw 10-20. This evening I heard some singing Hermit Thrushes singing. There were a number of Townsend’s Warblers that I heard and saw. Ordinarily it is difficult to see these birds, but the late spring and accompanying lack of leaves on the alders made it easier to see them. I saw a Brown Creeper at eye level on my morning walk, but my camera battery had died, and I was not able to take a photo. On my later walk I saw a second (possibly same?) 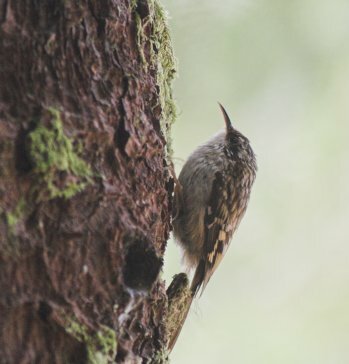 Brown Creeper and was able to get a photo of it (see above). Along the river I noticed some birds in the trees. They were too far away for me to identify conclusively, but it seemed likely they were Pine Siskins or Crossbills of some sort. When I made it to the estuary in the morning, the tide was in. I saw Mallards and a couple of male Green-winged Teal. While I was watching them, a couple of small sandpipers flew in. I suspect they were Western Sandpipers, but they were too far away to see for sure. Later in the evening I saw what I think were probably the same two birds in the area. On the south end of the park, I was able to observe a Winter Wren working on its nest. I had also been hearing many Winter Wrens singing throughout the woods as I walked. Given all the tourist traffic through the park, I had pretty much given up on seeing anything else as I walked down the beach towards the visitor center. However, just as I neared the visitor center, I noticed a small mixed flock of shorebirds with four Black Turnstones, one Ruddy Turnstone, one Least Sandpiper, and one Western Sandpiper. Other Notes: I was able to watch a mink run along Indian River. I saw it initially above the foot bridge and was able to follow its movements all the way down towards the estuary. This entry was posted in birds, daily, fauna, photo. Bookmark the permalink.